gorillas are the latest victim of political and ethnic conflicts, that have engulfed eastern Africa. About 300 gorillas live in Bwindi and 320 in the forests that run through Uganda, Rwanda and Congo. In a strange relationship, the survival of the local people depends on the revenue from tourism that these gorillas attract. The gorillas' survival, in turn, depends on the goodwill of the local people, who have agreed not to cut trees or clear land for farming in exchange for a share of the tourism money. The fact that tourism itself depends on peace, which is nowhere in sight, is another matter. Eight foreign tourists and a game warden were recently killed in the Bwindi National Park. Its immediate repercussion was a sharp fall in tourism. Abercrombie and Kent, one of the largest tour companies of Uganda, reported that three-quarters of its 1999 bookings had been cancelled. So if the tourists stop coming, will the local people be forced to destroy the gorilla habitat to earn their livelihood? "They are important when they bring in tourists," says Ignatius Byamugyisha, a villager. "If not, they are not. If the tourists don't come, we will try our luck in the forest. Before this, we were good timber-cutters," he says. Innocent gorillas, it seems, are also figuring in the casualties that have plagued the countries of the African Great Lakes -- Uganda, Rwanda, Burundi and the Democratic Republic of Congo -- since the early 1990s. This region holds some of the world's most precious forest, with rare plants and animals. In Rwanda, more than half a million Tutsi and moderate Hutus were killed in 100 days by Hutu extremists in 1994. The effect on tourism, which the rebels aimed to cripple, was immediate: both the us and the uk issued strong travel advisories to their citizens. Tourism from gorillas subsidises all 11 of the national parks in Uganda. It provides up to 70 per cent of the revenue to the national parks. Conservationists say that the attacks have also brought in scores of refugees who have settled in two-thirds of Akagera, the largest park in Rwanda. Sylvie Wabbes Condotti, a programme officer for the World Wide Fund for Nature in East Africa, says: "They are many areas that are on the brink of being damaged irreversibly." 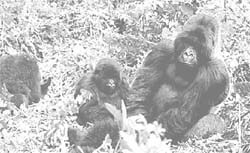 Several mountain gorillas have also been killed in Rwanda and Congo, one possibly by a landmine and several others in crossfire.